What: Celebrate the excitement of college basketball with a free poster-size bracket in-store at Staples beginning Monday, March 14. ESPN¹s highly-rated Bracketology selection show airs Sunday, March 13 (7 p.m. on ESPN, 9 p.m. on ESPN2). 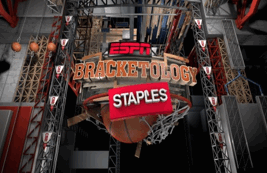 The following day and through March 16, college basketball enthusiasts can stop by a Staples store to get a Free 2¹ by 3¹ Bracket Poster (and additional special discounts) with the first round teams prepopulated in bracket formation. Small businesses engaging in a friendly-work competition, restaurants joining in on the fun, or buddies or families tracking their favorite teams, can get a free poster, plus shop Staples for all their other bracket celebration needs (Sharpies® to fill it out, snacks to eat while watching the games).